click here for Salat Schedule. Now you can donate using your credit card or PayPal account. You can pay cemetry annual dues online as well. Please click the Donate button. Donations are tax deductible. Georgia Islamic Institute is a religious, educational, non-profitable, non-sectarian, non-political, and independent institution committed solely to the religious, moral and intellectual training of the Muslims in America specially the youths. It is neither affiliated to any other organization nor subservient to any foreign state or government. It is located in the City of Lawrenceville, the beautiful suburb of Atlanta, Georgia. It was duly incorporated/registered as non-profitable organization on 04/28/1995 under the Laws of the State of Georgia. Georgia Islamic Institute has been duly incorporated as a non-profit religious organization under section 501 (a) of the Internal Revenue Code. Please click Donate button to donate online using your credit card or Paypal account. Checks can be mailed to : Georgia Islamic Institute, 177 Simonton Road, Lawrenceville, GA 30046. All donations to Georgia Islamic Institute are tax deductible. 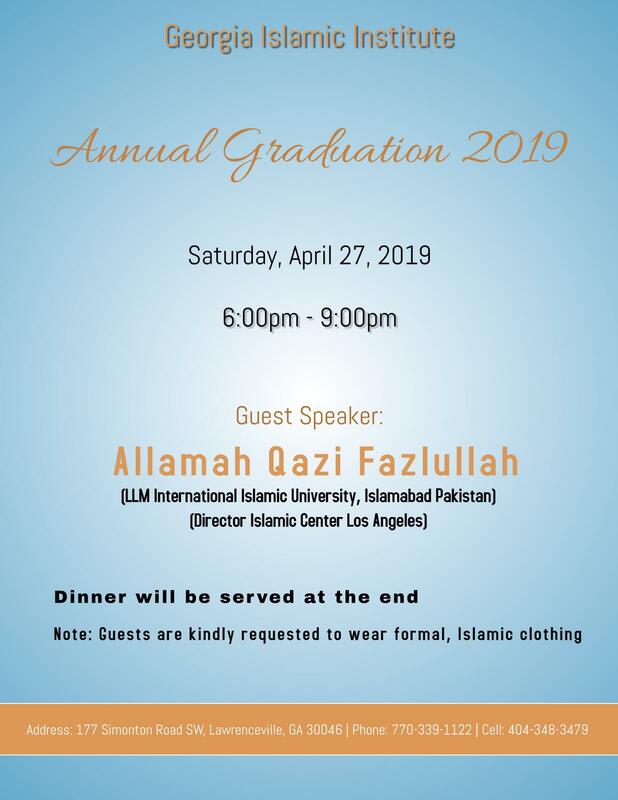 Annual Ijtima/Graduation at Georgia Islamic Institute is on Saturday, April 27, 2019. Please click here to view program details. Online schooling is provided with all courses.